Even though we do try to prevent it from happening, from time to time, dogs do become ill. Similar to humans, they may require a blood transfusion as a lifesaving treatment. Transfusions are required after serious accidents, during extensive surgeries, for dogs with diseases like haemophilia A, von Willebrand’s disease, chronic liver disease, or for dogs that have been poisoned with rat bait or suffered a snake bite. All our blood donors are privately owned by clients of Uni Vets Camden and surrounding vet practices. Apart from being in good health, blood donor dogs should ideally weigh more than 25kgs, and be less than eight years old. It is important that their vaccinations have been kept up to date, and that they are on heartworm and intestinal parasite prevention. Before being added to the blood donor register all donors are given a thorough health check, which includes the screening of a small blood sample in our laboratory. The lab will also determine the blood type of every donor. Only dogs in good health will be added to the donor register. This allows us to ensure that there is minimal risk of transmitting diseases through blood transfusions. Importantly, you will benefit from knowing that you and your dog may have saved another dog’s life. 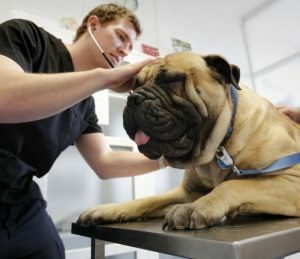 Your dog will be admitted for the day and given a general health check. If necessary, your dog may be given a sedative before collection begins. An area of hair is clipped around the neck and leg. Similar to a blood donation procedure in humans, a local anaesthetic may be applied to the skin around the vein, the vein is pierced and blood is collected into special bags. These bags are identical to those used when people donate blood. There is minimal risk to donors. Once registered, we call in our blood donors up to six times a year to donate blood. If your dog is in good health, weighs more than 25kgs and is less than eight years old, simply call us to book an appointment. If your dog is found to be in good health, they will then be added to the donor register.